Thank you for visiting our site. 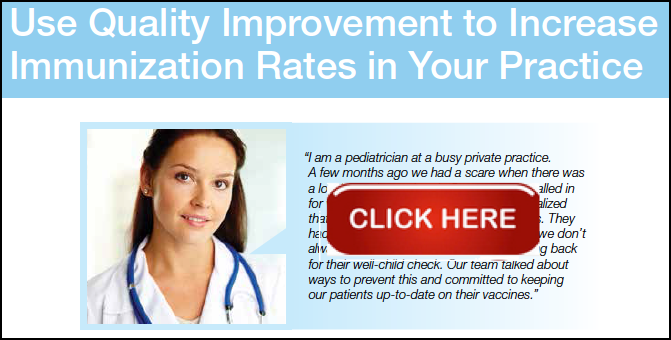 This project is led by the national office of the American Academy of Pediatrics (AAP) and is providing our chapter with tools, resources and technical support to lead a quality improvement (QI) effort amongst participating practices. The project aim is to improve vaccination rates for children up to two years of age. Other Chapters also participating in this project are CA4 (Orange County), Georgia, New Jersey, NY2, and Oklahoma. Fifty (50) points of American Board of Pediatrics (ABP) Maintenance of Certification (MOC) part 4 performance in practice credit will be offered for successful completion of the project and will be awarded in two cycles in 2017 (25 points) and 2018 (25 points). Randomization Data Collection Dates are posted below. Deadline is January 8. See the next section, below. The Final National AAP Webinars will be on January 17 and 18. You only need to attend one. The final Chapter Webinar is on Wednesday, February 28 at 12:15 PM. Please scroll down to "Training and Webinar Requirements for MOC" for webinar details. There's an updated form for practices who are having difficulties with CoCASA. Please download the Manual Chart Review for Coverage Rates and Recall Form (also found below). 1. Upload Data Into QIDA – Cycles end on the 7th of Each Month. As a reminder, the deadline to enter December data into QIDA is January 8th, 2018. For Missed Opportunities, December data corresponds to Cycle 13. For Coverage Rates and Recall, December data corresponds to Cycle 11. This will be the last/final data collection for this project. Thank you for all your great work! There are 3 main data collection forms for this project: Missed Opportunities, Coverage Rates, and Recall. Links to the printable forms are included below for your convenience. Once captured, data must be uploaded electronically into the AAP's Quality Improvement Data Aggregator, also known as QIDA. Click here to access QIDA. The "Missed Opportunities" Form will be completed every month by each practice, tracking the number of missed opportunities in the previous month. Once you have entered all of the data for one month be sure to close the data cycle and open a new cycle for the subsequent month. Specific instructions are included on this printable form. Be sure to enter your baseline data in order (December 2016 first, then January 2017 and then February 2017). For more details see "Data Collection Process." on the "Workspace" tab (see link below). The "Coverage Rate" Form will be completed monthly to track coverage rates for 19-35 month old patients each month. In California, this data will be obtained through the use of CoCASA and entered by the practice each month. Practices who send their coverage rates to Eunice Hong via the manual coverage rate worksheet can now use the updated manual coverage rate and recall activity worksheet. Note: Practices who are directly entering in their data on QIDA can continue to enter their recall as usual. Please visit the QIDA site to access all resources, available on the "Workspace" Tab, including "Data Collection Process". Additionally, the "Practice Narrative" Survey will be completed by your practice once during each action period (3 action periods). The responses should be discussed by the entire practice team but only one survey needs to be completed per practice. This requirement was completed in June. This 8-hour in-person training was completed on Saturday, October 28, 2017 in Pasadena. This webinar will be offered twice in January. You only need to attend once. All practices are required to attend. Registration not required for these events. Just join the meeting on your preferred date/time using the links below. These will also be emailed to everyone prior to each event. Dial-In Number(s): (866)519-2796, Passcode 886443 or Streaming audio available through your computer by clicking on link above. Dial-In Number(s): (888)373-4398, Passcode: 671147 or Streaming audio available through your computer. NOTE: There will not be a 4th Wednesday webinar in January of 2018. For your convenience, we have included below a blank copy of the PDSA sheet in both Word and PDF formats. Please use these to create clean and easy to read documents as they work better than photocopied material. The following two documents are made available for practice leaders to formally present the intent of the project to all clinic staff. It includes a PowerPoint slide deck, which you can customize, and a Facilitator's Guide. Click the links below to access both and save to your computer. Please click below to access the CoCASA User Guide. 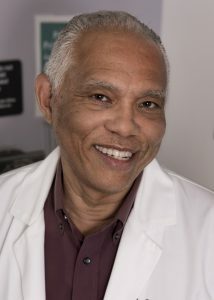 Edward Curry, MD, FAAP Chapter President / CQN Immunizations Physician Project Leader. Director of Medical Education at the Kaiser Fontana Medical Center. Practices in the areas of general pediatrics, autism, learning and behaviors. Was Chair of Quality Improvement Department at Kaiser for 6 years. Was faculty on Bright Futures Preventive Services QI Project (published in Pediatrics). Involved in multiple KP initiatives to improve pediatric immunization rates. Trained in India at Mahatma Gandhi Mission’s Medical College, Navi Mumbai. Pediatrics Infectious Diseases fellowship training at Boston Children’s Hospital. 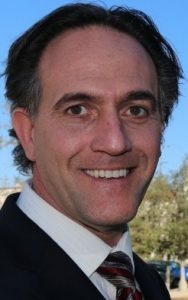 Tomás Torices, MD - CA2 Executive Director / CQN Immunizations Project Manager. Chapter Executive Director since March, 2014. Over ten years of medical practice abroad (Baja California and Sonora, Mexico). Five years coordinating an immunizations taskforce in Southeast Los Angeles. Eight years as EMR clinical documentation physician champion. Project Manager for CQN4 Asthma in 2015; HPV 2016; Immunizations 2017.